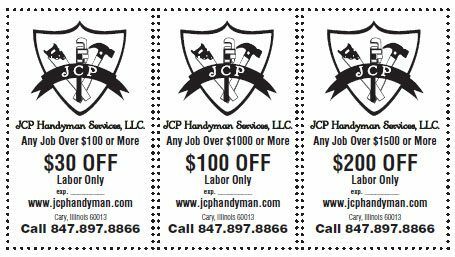 JCP Handyman Services, LLC has been a well respected handyman in the Cary area since its inception. Specializing in Handyman, Drywalling and Painters. I provide handyman services in both the public and private sectors in the Cary area, and I handle everything from simple home improvement projects to commercial remodeling. My biggest asset is my dedicated, hardworking, safety conscious subcontractors. Anyone that walks on any of my work sites exhibits the height of professionalism at all times. I may not be the most well-known handyman in Cary or the most expensive handyman in the Cary area, but I am simply the most honest, most customer oriented handyman you will find anywhere. If you have any type of construction project, I’ll consult with you, find your unique needs, and see if I can devise a solution to fit your desires and your budget. I have an excellent reputation in the Cary, Crystal Lake and Algonquin area, fully insured and bonded, and renowned for spectacular customer service. Most of all, I am very proud of my subcontractors, and are sure you will be too, as proud as you will be of your construction project when it is complete. I look forward to hearing from you and hopefully from helping you realize your project. Feel free to call with any questions or you can simply contact me on my contact page on this website. For more information about our company, please contact us by phone at (847) 897-8866 or by email.